(February 14, 2012) Former Energy Probe director says systems upgrades necessary to ensure power service reliability. Delaying reasonable and required capital improvements could increase the utility’s liabilities and costs for future ratepayers, energy consultant Tom Adams told the Nova Scotia Utility and Review Board on Tuesday. (BRIAN MEDEL / Yarmouth Bureau). 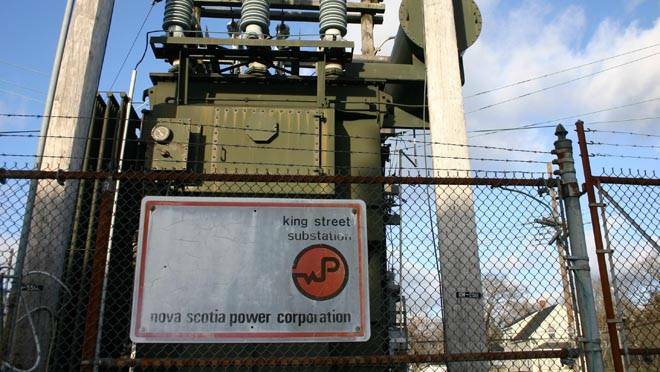 Hard economic times shouldn’t sway the provincial regulator as it reviews Nova Scotia Power’s capital spending plan, a veteran energy consultant says. “It’s not wise practice for utilities to be subject to capricious pressures that prevent them from making needed investments in an orderly fashion,” said Tom Adams, former executive director of Energy Probe. NS Power appeared before the provincial Utility and Review Board for the second day Tuesday seeking approval for $330 million in capital spending this year on 388 projects. Small business advocate Nelson Blackburn said the volatile economy should be taken into consideration by the regulator as it reviews the utility’s capital program for 2012.“We are in difficult economic times, and (NS Power’s) projects should be prioritized such that there would be little or no effect on ratepayers,” he said in a statement filed with the regulator. But Adams said delaying reasonable and required capital improvements could increase the utility’s liabilities and costs for future ratepayers. NS Power president and chief executive officer Rob Bennett said the economy is part of the equation when the Emera Inc. subsidiary makes decisions to invest in a new project. “There is a concept called intergenerational transfers,” Bennett said. Yet Adams said each the utility’s proposed capital investments should be carefully scrutinized to avoid a “gold plated” system. It’s an issue consumer advocate Bill Mahody raised during the two days of hearings. He said ratepayers need assurances that NS Power is making decisions with consumers in mind, rather than attempting to build the rate base to maximize returns. Indeed, reconciling the interests of ratepayers with shareholders was a recurring issue during the hearings. Board commissioner Kulvinder Dhillon questioned the opening statement of Mark Savory, vice-president technical and construction services for NS Power. He pointed to the utility’s three key questions used to justify a project, which include why do the project, why do the project now and why do the project in this way. Dhillon questioned if NS Power considers the effect on customers and whether that was part of the consideration. Bennett said the value for customers is always a priority when decisions are made to improve the system. This entry was posted in Nova Scotia and tagged Business, Energy Probe, Nelson Blackburn, nsp, review board, small business advocate, Tom Adams, utility. Bookmark the permalink.